Art Glein was born in North Dakota in 1907 and moved to Tacoma in the mid-1920’s. In the mid-1930’s Glein started his boatbuilding career by building a yacht in his North Tacoma backyard. He later operated a boat servicing facility near Old Tacoma. 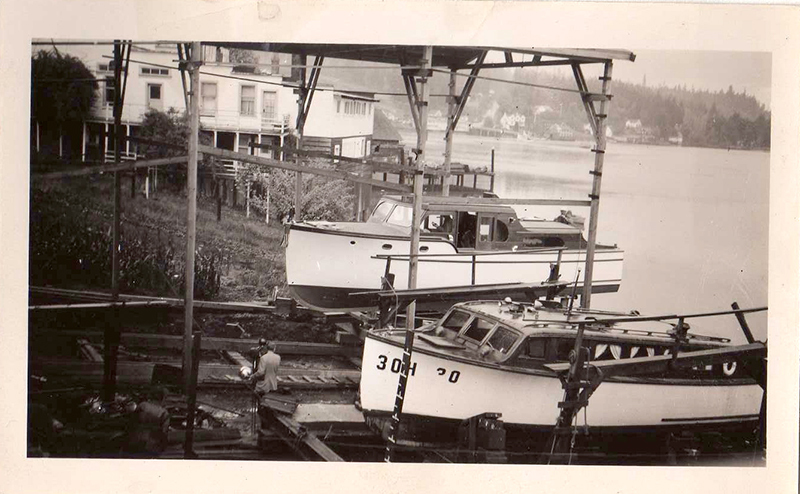 In 1945 Glein purchased the Conrad Anderson Boatyard on Gig Harbor’s waterfront and built the existing facility, now known as the Eddon Boatyard, and the adjacent clinker brick home. Glein Boat Company repaired all manner of boats and built new yachts and fishing boats (see photos below). In January 1950, Gig Harbor Bay froze over trapping boats and making it impossible to launch and haul boats. Frustrated, he put the yard up for sale finding willing buyers in Ed Hoppen and Don Harder.